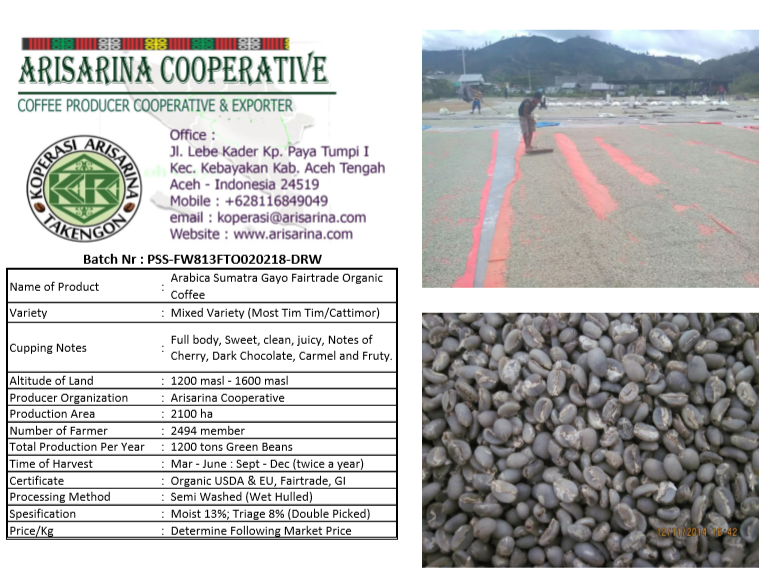 Established in 2013, Arisarina is located at the highlands of Gayo, Aceh Province and has more than 1700 coffee farmers as members. They share a common goal and passion to improve the quality of coffee that grows in the Gayo highlands as well as to maintain and preserve the ecosystem as a place to grow of the highest quality coffee beans. Every year, Arisarina produces around 954 ton of green beans from their 263 hectare plantation. The types of coffee they produces are Gayo Arabica Grade 1 (Conventional), Gayo Arabica Grade 1 (Certifications from FTO, USDA, UTZ and EU, Gayo Arabica Longberry, Gayo Arabica Peaberry Single Variety & Single Farmer and lastly Gayo Arabica Grade 1 Fully Washed. In 1995 base on Ir. Tarmizi A. Karim,Msc initiative in Pondok Gajah Village Bandar Sub - district (currently Bener Meriah District) UKM (Small scale business) Baitul Qiradh Baburrayyan is established. Operational permit Baitul Qiradh Baburrayyan is obtained/ issued by Pusat Inkubasi Bisnis Usaha Kecil (PINBUK) Jakarta No.211/SKET/PINBUK/E/V/VII-95. Initially cooperative activity is started at Bandar Pondok Baru, by providing capital to the low class trader. Due to the long conflict at Aceh Province including in Bener Meriah, in 2000 LKM Baitul Qiradh Baburrayyan had to be closed. Era of Cooperative ( KBQ Baburrayyan) In October 2002 Rizwan Husin is re initiative to re established Baitul Qiradh Baburrayyan in Takengon Aceh Tengah District. In October 21 October 2002. Law Legitimate Cooperative Baitul Qiradh Baburrayyan is approved by Kepala Dinas Koperasi Aceh Tengah. (Chairman Cooperative Service of Aceh Tengah District). Product certification are organic certification for Europe (EU) and organic certification (USDA/NOP) for USA. Gayo Antara Cooperative was established on September 10, 2015 with a purpose of establishing this cooperave is to promote the economy and improve the welfare of its members. 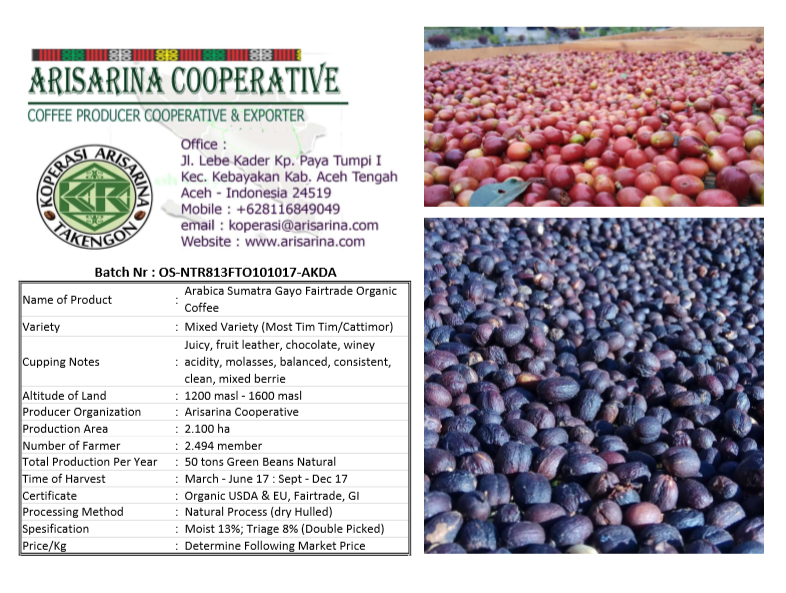 Located in Bener Meriah District, Gayo Antara's goal is to increase member's economic income by producing excellent quality of coffee for national and international market. Gayo Antara cultivates Arabica coffee varians namely TimTim, Camor and Ateng. Arabica varians dominate the types of coffee beans developed by Gayo Antara farmers and comes from the condition of volcanic soil, the type of soil that has a high nutrient, With an altitude between 1,200 to 3500 above the water surface. In 2007, several Indonesia coffee farmer groups, exporters, roasters dan retailers decided to create a Specialty Coffee Association of Indonesia (SCAI) to improve and increase the quality of Indonesian Arabica coffee quality and quantity. SCAI were then established in 2008 and its membership are open for individual, institutions and coffee communities who's in the specialty coffee industry (Formerly only Arabica but later Fine Robusta also available) from Indonesia. All are Including individual farmers, farmes group, buyers, roasters, exporters, retailers and individual person who had same mission. The Tagline of the Association is “Excellent in Diversity” which are reflection of the diversity of Indonesian Coffee flavors, the variety among farmers who grow it and environment where its planted spreads put from West to the East of Indonesia Islands. Every Ecosystem and soil of Indonesia has created to the coffee with the uniqueness cupping profiles according to where the coffee grow. Specialty Coffee Association of Indonesia (SCAI) had more than 550 members, respresenting all the Indonesian coffee industry from upstream to downstream in Indonesia. Suppliers of the ingredients for coffee production and coffee supporting equipment. Agency Certifying official (certifier), Institute for Research / Coffee Reseach Agency. Non Governmental Organization, Indonesian Government and NGOs. Cooperative, Coffee Farmers, Coffee Exporters, Coffee Importers and retailers of coffee. Cafe owners, Coffee Consultants, Coffee Roasters, barista even Coffee Lovers. AEKI (Association of Indonesian Coffee Exporters and Producers) was established to unite coffee exporters and aid the Government in making coffee business policy where since 1969, International Coffee Organization (ICO) apply quota for its members. In practice, coffee trade system (quota) that is applied by the ICO is not always based on ratio as it can be suspended from time to time. As a result, the market system eventually becomes a free market. AEKI is the association for export companies, processed coffee industry, and companies in other Indonesian coffee industry based on Pancasila and The Constitution of Indonesia 1945. AEKI is not bounded to any Indonesian political party. To build a coffee community that is prosperous, resilient and able to contribute to National economic development.